FARFA may be visiting your town! You work hard to raise food. Now raise your voice! Farm and Ranch Freedom Alliance is hitting the road to meet with and hear from independent family farmers, ranchers, and others in small-scale agricultural production across the State of Texas. 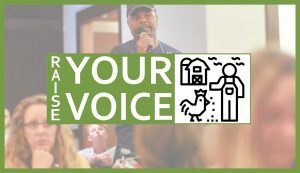 This campaign, called “Raise Your Voice,” provides opportunities for farmers, beekeepers, and local food producers to tell FARFA about the issues most impacting them. Our goal is to visit as many regions of the state as possible over the coming months. “With a state this size, we can’t assume the challenges are the same for farmers in every region,” says Executive Director Judith McGeary. Each stop will include a listening session during which she will gather input on policies that are either helping or hindering farmers in running successful businesses. Also on the agenda is an activism training session so that farmers gain skills to have their voices heard at all levels of government. FARFA will utilize the information gathered during these sessions to shape FARFA’s work for the 2019 Texas Legislative Session. Raise Your Voice is supported by grants from Farm Aid and the Clif Bar Family Foundation. Watch coverage of FARFA’s recent visit to Amarillo! For the Waco event, we are joined by Grow North Texas, who will host our Small Farmer Workshop. 4 p.m.-6 p.m. Grow North Texas and FARFA present Cottage Foods and Local Food Regulations. This workshop will cover the Texas Cottage Food Law in detail, for producers who want to make food in their home kitchen (rather than a commercial kitchen). Learn what & where you can sell, as well as get more information about common concerns like advertising, sampling, and insurance. The workshop will also cover state laws on selling eggs, meat, and other products (note that local regulations on these topics may differ). FARFA’s Executive Director also will encourage sharing of any issues participants have regarding regulations that impact their local food production and marketing efforts. 6-6:30 p.m. Meal provided by FARFA & Grow North Texas. Gluten-free and vegetarian options also available. 6:30-8 p.m. Listening session and Cottage Foods Workshop resume. 8-8:30 p.m. Advocacy training session providing you with tools for effective communications with elected officials and for inspiring change. We’ll start with an informational session on Cottage Foods and Local Food Regulations. This workshop will cover the Texas Cottage Food Law in detail, for producers who want to make food in their home kitchen (rather than a commercial kitchen). Learn what & where you can sell, as well as get more information about common concerns like advertising, sampling, and insurance. The workshop will also cover state laws on selling eggs, meat, and other products (note that local regulations on these topics may differ). FARFA’s Executive Director also will encourage sharing of any issues participants have regarding regulations that impact their local food production and marketing efforts. The evening ends with a brief advocacy training session providing you with tools for effective communications with elected officials and for inspiring change. For the North Central Texas events, we are joined by Grow North Texas, who will host 2-hour workshops on topics of significance to growers and local food producers. 5:30-8 p.m. FARFA’s “Raise Your Voice” listening session and advocacy training.